Is it possible to recover deleted iMessages from iPad no backup? Is it possible to recover deleted iMessages from iPad no backup? There are many methods to retrieve iPad imessages. Here, the easiest way is shared to get back iPad iMessages no backup. As fans of Apple device like iPhone and iPad, it is widely recognized that iMessage is the most economical and safest way to communicate (sending text message, photos and videos) with your friends and families. So when those imessages are deleted from iPad or iPhone without backup, is it possible to recover them? Definitely yes. Just keep reading and follow the methods below. Can't miss: How to retrieve deleted iMessages on iPhone? As to retrieve iPad deleted imessages without backup, I think the easiest way to find and get back imessages from iPad is to view them from other iDevice using the same account with iPad. In other words, if you are sharing the same account in other iDevice in iMessage, when you receive imessages in your iPad, you will also receive them on your iPhone or other iPads. So you can check deleted imessages there. If nothing is found there, don't panic. We still have another method to help you recover deleted imessages from iPad without backup. Actually, after you delete imessage from iPad, the imessage don't actually get deleted. It's because the deleted imessages is technically marked for deletion by the system and hidden so that they become invisible to us. 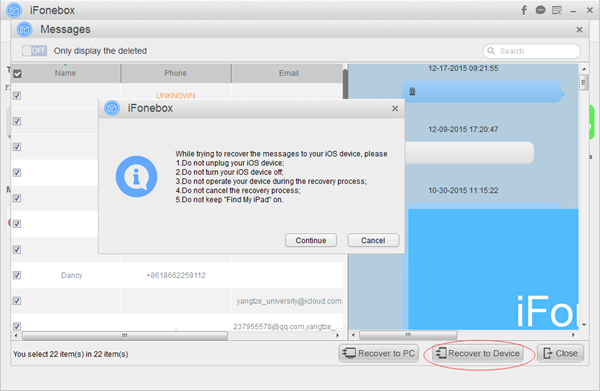 Thus, in order to recover deleted imessages from iPad without backup, iFonebox is just the best choice for you. It is known that iFonebox is a professional iPhone data recovery tool which can not only directly recover deleted or lost data like text messages, wechat messages, whatsapp messages, contacts, notes, etc, from iPhone or iPad, but selectively extract and restore lost data from iTunes or iCloud backup, without wiping data in your iOS device. One more thing, iFonebox is able to transfer recovered imessages back to your iPhone directly, the same function as contacts and notes. Well done. Before starting sharing steps to get back deleted imessages from iPad no backup, you need to download and install iFonebox on your computer firstly. Two versions are accessible: Windows version and Mac version. How to recover deleted imessages from iPad without backup? Launch iFonebox. Choose Recover from iOS Device mode. Please connect your iPhone to the computer with USB cable so as to scan and recover lost old text messages to it. Once connected successfully, your iPhone will be detected by iFonebox. If it is the first time to connect your iPhone to the computer, you need to choose Yes when asked whether to "Trust the computer" on your iPhone screen. Click Start button to begin. Notes: If you want to recover found text messages back to your iPhone, you'd better turn on Airplane Mode when connect your iPhone to the computer, just in case of messages transferring failure because of new text messages received during the process. Steps are here. Scan iMessages from iPhone. Just click on Messages item to start scanning. iMessages are contained in Messages item. Preview and select deleted imessages to recover. After automatic scanning, you have the chance to preview and choose deleted imessages you need, and then, Click Recover to Device button to end the process. PS: Once clicked, just follow the reminders pop-up from the software. You need to turn off Find My iPhone in advance. After restoring, your iDevice will be restarted and then upgrade. Once all are done, those selected old messages have been in your iPhone safely and successfully.